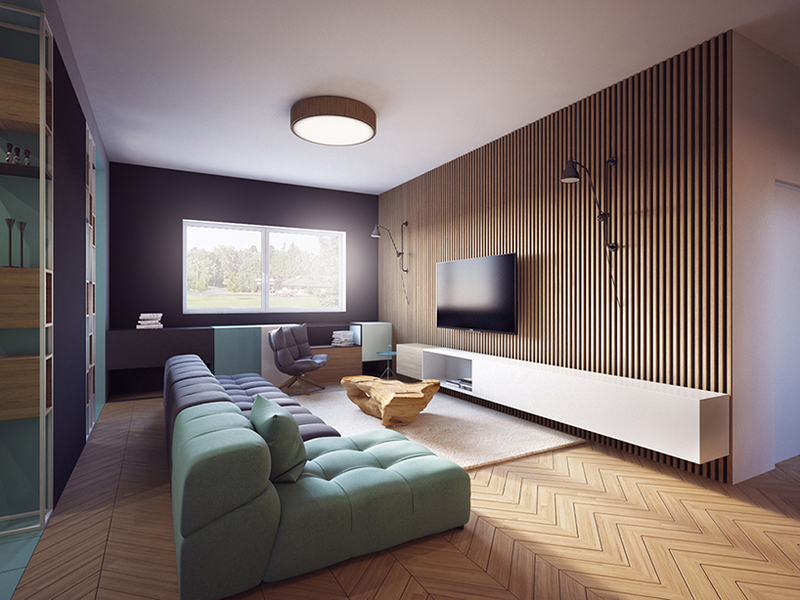 multi-disciplinary design studio proxy has presented its vision for an apartment interior located in the center of skopje, macedonia. the project, entitled ‘VI interior’, is 116 square meters in size and divided into two unique zones, based on cycles of day & night. the ‘day’ area consists of both the living room and kitchen. proxy separates the two spaces with a single interior wall, bracketed on either side by bookshelves. these modular, cubic bookshelves open on either side for ease of access from both rooms, helping to broaden the sense of space between the two sections. the main wall of the living area is defined by its veneer of vertical wood panels, creating a tangible texture within the space that extends into the hallway. 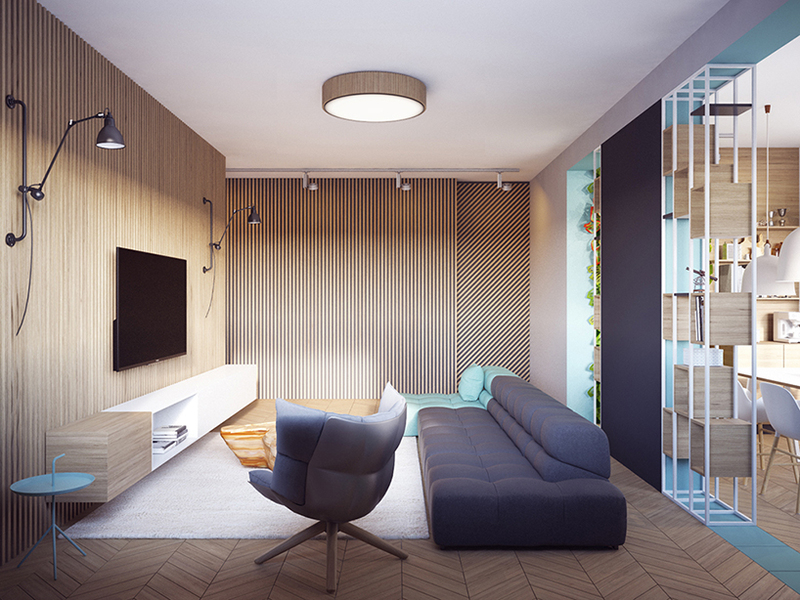 here, a hidden door marked with diagonally aligned panels provides access to the rest of the apartment. 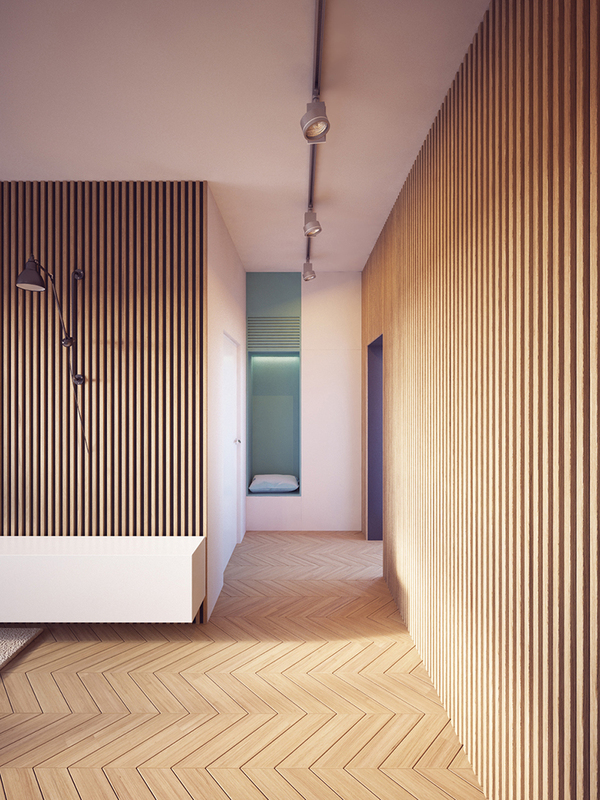 the whole area is characterized by the use of desaturated pastel tones and plenty of oak elements, which compliment the chevron patterned floor. these wooden elements become a recurring motif throughout the design, and are used as a subtle means of unifying the different interiors. in contrast to the muted purples of the living room, the kitchen is brilliant white, highlighting its wooden detailing. 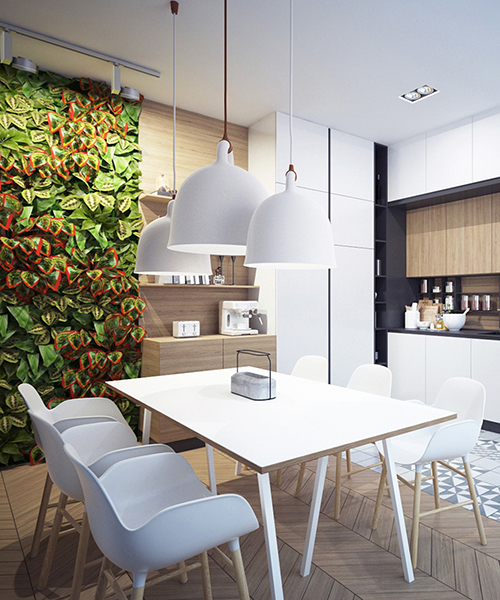 the most remarkable feature is its vertical ‘plant wall’, covering one side of the kitchen and injecting more than a bit of life into the space. 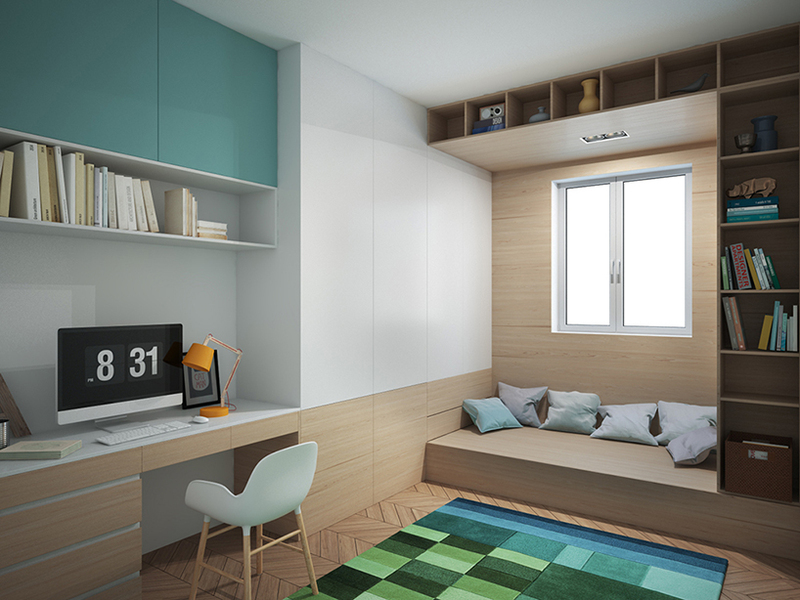 the ‘night’ zone consists of the master bedroom and children’s room, which can also function as a home office or lounge. in the modest, gray-toned bedroom, the vitality of the day zones is reduced to a more mature, serene personality. a deep-set cubed headboard subtly echoes the shelves of the kitchen, and provides a sense of solidity and shelter to the sleeper. overhead, a cluster of red hued lamps inject a pop of color into the rest of the space. in the children’s room/study, wardrobes are flush with the walls creating discreet, unobtrusive closet space, while clever use of shelving frames and defines a reading cubby. 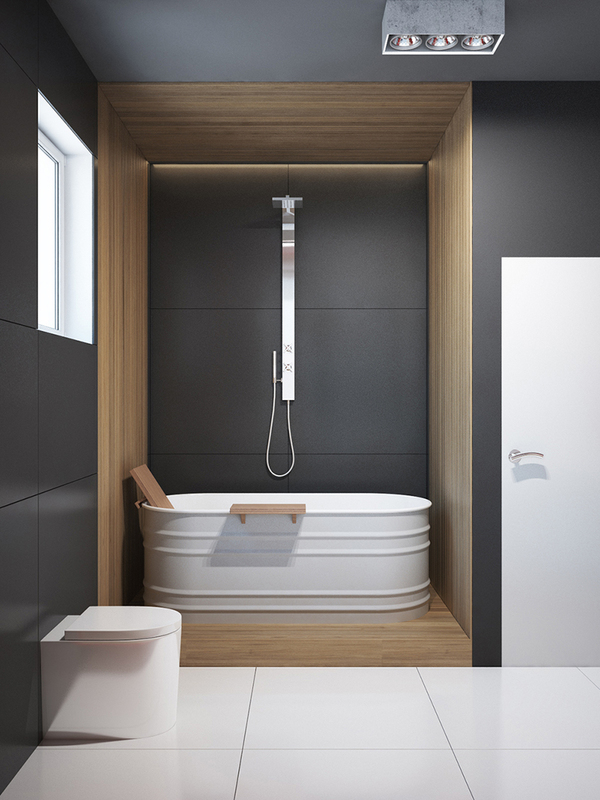 the design takes on an industrial aesthetic in the bathroom where a deep, old-style metal tub is matched with a oil-barrel sink, adding a rugged but stylish utilitarian flare to the tiled area. 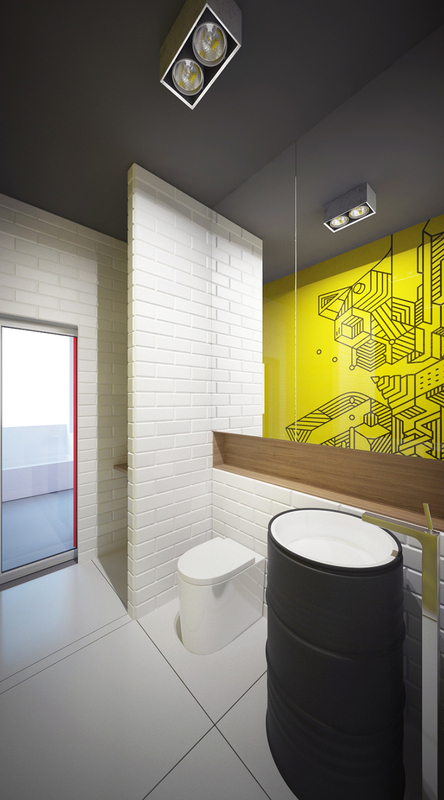 wood is used here once again to outline the different programs of space, offset by a large graphic wall whose bright yellow color paints the room in a more playful light.